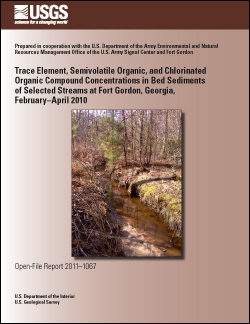 A spatial survey of streams was conducted from February to April 2010 to assess the concentrations of major ions, selected trace elements, semivolatile organic compounds, organochlorine pesticides, and polychlorinated biphenyls associated with the bed sediments of surface waters at Fort Gordon military installation near Augusta, Georgia. This investigation expanded a previous study conducted in May 1998 by the U.S. Geological Survey, in cooperation with the U.S. Department of the Army Environmental and Natural Resources Management Office of the U.S. Army Signal Center and Fort Gordon, that evaluated the streambed sediment quality of selected surface waters at Fort Gordon. The data presented in this report are intended to help evaluate bed sediment quality in relation to guidelines for the protection of aquatic life, and identify temporal trends in trace elements and semivolatile organic compound concentrations at streambed sites previously sampled. Concentrations of 34 major ions and trace elements and 102 semivolatile organic, organochlorine pesticide, and polychlorinated biphenyl compounds were determined in the fine-grained fraction of bed sediment samples collected from 13 of the original 29 sites in the previous study, and 22 additional sites at Fort Gordon. Three of the sites were considered reference sites as they were presumed to be located away from potential sources of contaminants and were selected to represent surface waters flowing onto the fort, and the remaining 32 nonreference sites were presumed to be located within the contamination area at the fort. Temporal trends in trace elements and semivolatile organic compound concentrations also were evaluated at 13 of the 32 nonreference sites to provide an assessment of the variability in the number of detections and concentrations of constituents in bed sediment associated with potential sources, accumulation, and attenuation processes. Major ion and trace element concentrations in fine-grained bed sediment samples from most nonreference sites exceeded concentrations in samples from reference sites at Fort Gordon. Bed sediments from one of the nonreference sites sampled contained the highest concentrations of copper and lead with elevated levels of zinc and chromium relative to reference sites. The percentage change of major ions, trace elements, and total organic carbon that had been detected at sites previously sampled in May 1998 and current bed sediment sites ranged from -4 to 8 percent with an average percentage change of less than 1 percent. Concentrations of major ions and trace elements in bed sediments exceeded probable effect levels for aquatic life (based on the amphipod Hyalella azteca) established by the U.S. Environmental Protection Agency at 46 and 69 percent of the current and previously sampled locations, respectively. The greatest frequency of exceedances for major ions and trace elements in bed sediments was observed for lead. Concentrations of semivolatile organic compounds, organochlorine pesticides, and polychlorinated biphenyls were detected in bed sediment samples at 94 percent of the sites currently sampled. Detections of these organic compounds were reported with greater frequency in bed sediments at upstream sampling locations, when compared to downstream locations. The greatest number of detections of these compounds was reported for bed sediment samples collected from two creeks above a lake. The percentage change of semivolatile organic compounds detected at previously sampled and current bed sediment sites ranged from -68 to 100 percent with the greatest percentage increase reported for one of the creeks above the lake. Concentrations of semivolatile organic compounds and polychlorinated biphenyls in bed sediments exceeded aquatic life criteria established by the U.S. Environmental Protection Agency at three sites. Contaminant compounds exceeding aquatic life criteria included fluoranthene, phenanthrene, anthracene, benzo(a)anthracene, chrysene, benzo(a)pyrene, and pyrene. The most frequently detected organic compounds among bed sediment samples were pyrene, chrysene, and fluoranthene, which were detected in more than 45 percent of sites and reported at concentrations exceeding probable effect levels for the amphipod Hyalella azteca established by the U.S. Environmental Protection Agency. Thomas, L.K., Journey, C.A., Stringfield, W.J., Clark, J.M., Bradley, P.M., Wellborn, J.B., Ratliff, W.H., and Abrahamsen, T.A., 2011, Trace element, semivolatile organic, and chlorinated organic compound concentrations in bed sediments of selected streams at Fort Gordon, Georgia, February–April 2010: U.S. Geological Survey Open-File Report 2011–1067, 53 p.